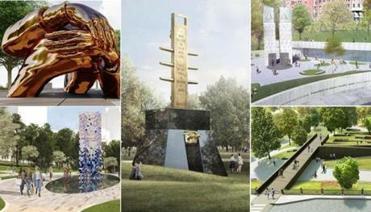 King Boston has named five finalists in the competition to design the Boston Common memorial. Efforts to memorialize the Rev. Martin Luther King Jr. and Coretta Scott King in Boston got a significant financial boost Monday, as the Boston Foundation and Boston University marked Monday’s holiday by announcing a combined $750,000 in support. The foundation, an influential charitable group, said it is contributing $500,000 to the King Boston project, whose plans include a memorial to the Kings on Boston Common, commemorating the couple’s time in the city where they met and fell in love. Boston University, where King earned his doctorate in theology in 1955, said Monday that it will donate $250,000 to King Boston. University president Robert A. Brown announced the donation at a joint Martin Luther King Jr. Day celebration with city officials on the BU campus. King Boston has now raised about $5.6 million, including the gifts announced Monday, according to Paul English, the Boston technology executive who is founder and cochairman of the effort. English said in an interview that the organization now has enough money to create the Boston Common memorial and that the group hopes to soon announce a final design for the project. But King Boston is hoping to raise a total of about $12 million to support other projects, including the creation of a new King Center for Economic Justice in Roxbury, which will take on issues of inequality in Boston. The group is also seeking to create a $1 million endowment with Roxbury’s Twelfth Baptist Church to support programming that highlights King’s time preaching at the church while he lived here. And King Boston is working on a documentary about the Kings’ time in Boston, where Coretta Scott King was a student at New England Conservatory. The ceremony commemorating what would have been King’s 90th birthday featured orchestral and choral renditions of praise and protest songs by youth organizations. And speakers urged the crowd to see the Kings’ story through the lens of the complex history of race and justice in Boston. Paul Grogan, president and chief executive of the Boston Foundation, said in a statement that King’s message of social and economic justice is as important today as it ever has been. US Representative Ayanna Pressley, keynote speaker at the BU event, said the King Boston project provides a well-deserved honor for Coretta Scott King, who continued her husband’s work after his assassination.